Apple has just updated its iTunes app with a couple of rudimentary improvements and bug fixes. Notably, the bug that would previously cause iTunes to quit unexpectedly when syncing switched from wired and wireless has now been plugged, and a further issue which meant users would need to sign in repeatedly to the iTunes Store has also been sorted out. More details after the break. 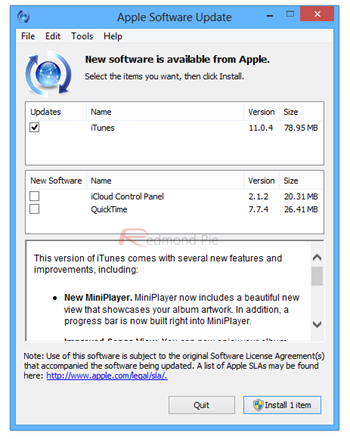 Last time around, Apple rolled out iTunes 11.0.3 which brought quite a few new features including a revamped MiniPlayer, improved songs view, and support for albums with multiple discs. That was last month, and while this update is more about housekeeping than the showcasing of anything exciting and new, it’s still good to see Apple working hard to keep its famously bloated player in check. After some delay, iTunes 11 finally manifested itself back in November of last year. Apple completely reshuffled many of the long-standing features, in the process also managing to afford the Store a much-needed overhaul. Opinion, as ever with such a radical update, has been divided on whether iTunes has improved enough or rather moved sideways, but with Apple having now sorted out some of those early bugs, I would say it’s definitely in a lot better shape than it has been for a very, very long time. The 11.0.4 update can be grabbed via the Mac App Store’s Software update feature if you happen to be on OS X, and even if you haven’t encountered any of the aforementioned issues, it’s always best to be up-to-date. Those on Windows can also update the usual way, which involves going to Help > Check for Updates from within the app. Of course, those on either platform can also take the old-fashioned route by simply pointing their browser to: apple.com/itunes. As ever, we’ve given the new iTunes a run-out on our MacBook Air running the OS X 10.8 Mountain Lion, and can vouch for the fact that, at least during our trials, the bugs mentioned in the changelog appear to have been duly squashed. So, grab the new iTunes for Windows and or Mac, and be sure to let us know if you spot anything amiss by leaving a comment via the usual mediums below.